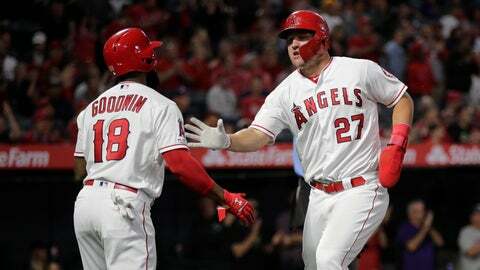 ANAHEIM, Calif. (AP) — Mike Trout is hopeful he won’t be out of the Los Angeles Angels‘ lineup for long, but he remains cautious since it is early in the season. The star outfielder was out of the lineup Wednesday night against the Milwaukee Brewers in order to rest the right groin he strained Tuesday night. Trout added that he was pleased with the progress made overnight, which is why he thinks he won’t be out for long. The Angels have Thursday off before beginning a three-game series Friday in Chicago against the Cubs. Weather could play a factor though in when Trout could return, especially if it is cold and windy. Trout said he had not looked at the weather forecast, but manager Brad Ausmus said it will be a factor and taken into consideration. Brian Goodwin moved to center field and David Fletcher got the start in left in the series finale.